Level select screen. It looks like the 32X version’s, but here the level order is preset — no level selection. 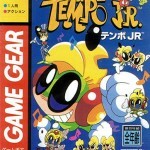 Tempo Jr. is a platformer by Sega for the Game Gear released in 1995. It’s one of the Sega Club titles. 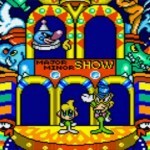 The Sega Club was a line of games for the Genesis, Sega CD, and Game Gear aimed at a young audience, and all Sega Club titles are both easy and short. Tempo Jr. is no exception; this game’s extremely easy and it’s not very long either. Unless you’re a young child, expect to beat it without dying, and in not much time either (over an hour at most). The other Sega Club games, like Kids on Site for Sega CD, or Bonkers or Ecco Jr. for the Genesis, are similarly extremely easy and content-light. The Game Gear’s kind of funny, it has some pretty difficult games, like Sonic 2, but also some of the shortest and easiest games I have ever played, like Tom and Jerry: The Movie or The Lost World: Jurassic Park. This game is in the latter category, though it is a lot more fun than either of those games. The difficulty… I’ve described, but at least it’s longer than a few GG games, though compared to games as insultingly short as those are, that is admittedly not saying much. Seriously, The Lost World ends almost as soon as it begins… and that was a 1997 release too, Sega’s last GG game! You’d think they’d have tried. Oh well.. 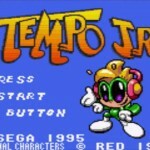 However, despite that, Tempo Jr. isn’t without worth, and even though I spent $7 for the cartridge and beat it in less than a couple hours of total playtime without dying a single time (and no, there are no difficulty level settings), I had fun enough that I don’t feel like I wasted my money. 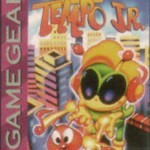 Tempo Jr. is the second of the three games in the Tempo series, and it’s the last one that got a US release. The first game is Tempo the 32X, and was designed by the guy behind Bonk’s Adventure if I remember right. It’s a good game. Not a great game, but a good game. It’s a bit slow paced, and I wish it had on-cart saving instead of passwords and made more use of the 32X (it really only uses it for the animating, colorful backgrounds and nothing else just about), but it’s fun. The last game is Super Tempo, 2d platformer for the Saturn released in 1998 only in Japan. It’s maybe the best Tempo game, but it’s also quite expensive. Tempo is, as the image above shows, an animate green bug of sorts with headphones on. He’s supposed to be cool and into music. Yeah, he’s a product of ’90s character art design for sure, almost painfully so. But still, his design is certainly dated, but eh, it works okay enough, and I do like the color (green). In the original game, Tempo has a girlfriend, Katy (naturally, she wears a pink dress… of course.). She is in this game, but all she does is dances with Tempo after you beat levels, unlike the original game where she can actually help you (flying around or following him or something at times, I forget the exact details). Oh well. Controls – The game controls well. Tempo can jump, roll, kick, shoot music notes, and dance. Tempo can also hover by pressing the jump button again in the air; he’ll then very slowly descend, and there’s no flight timer or something, only your slowly descending height. Music notes will stun enemies, at which time you can jump on or kick them. Your normal dance is mostly just for fun, but if you collect the right powerups and your healthbar starts flashing, pressing A+B together will activate a special dance that drains half of Tempo’s health, but destroys all enemies on screen. It’s not too useful given how easy the game is, but it’s fun to do once in a while anyway. At the parts where Tempo’s looking depressed and moving slowly, kick the thing and he’ll get happy again. This might be a checkpoint? I’m not sure, it’s so hard to die I never found out. 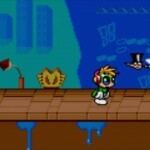 Gameplay – It’s a platformer. Kill the enemies, explore stages to find the items, the usual. There are no pits of death here — that’d be too tough for this game’s very young audience apparently. Instead, pits and spikes just do damage, and not much of it. Most enemies drop health when killed, so running out of health is not easy. The levels are solidly designed and sized about right. The game is made up of four of five worlds, each with two levels and then a boss, with a minigame after that if you got any coins to use in it. As I said, the levels are quite easy. They’re decent length, to the point where I found myself getting bored after a couple of levels, so I didn’t beat this game all at once; instead, I left it on for some time and came back later (yes, I use my GG on AC power, not with batteries.). There are passwords, but you have to get a game over to be given one, so unless you intentionally get a game over, you won’t be seeing them. I did get a game over once, after beating the game, to make sure that the passwords are indeed there; they are, accessible from the game over screen. Given the slow pace and minimal difficulty, they’re even almost useful… you may not want to play it all at once. As for the bosses, they’re simple, but fun. Most bosses have very easily exploitable patterns, so don’t expect anything too hard, but they are a bit tricker than the stages are, at least until you figure them out. Like the rest of the game’s visual design, the bosses have good, clear designs. I like the bosses, from the frog to the penguin to the toy soldier guy. It’s kind of boring when all you usually have to do is stand still, or walk back and forth, while kicking… but oh well, at least the designs are good. As for the minigames, they’re fun as I said. Levels 1 and 3 have a Simon-inspired minigame, levels 2 and 4 a game of chance and strength, pretty much. They’re fun diversions. I’m absolutely terrible at the Simon game… it’s got eight different buttons that light up (named after the eight music notes, naturally; remember the musical theme), and I always mess up quickly. I didn’t get past a +500 bonus. The other game is a bit easier, but more random. After beating the main worlds, there’s a short boss rush. You don’t refight all of the bosses, you see; instead, you only fight two of them, and then the final boss. The final boss is a lot like the first boss, but with a few more moves. After that it’s an ending screen, some credits, and then it’s over. Yeah, you don’t play this game for its great ending either. Graphics – Obviously, they couldn’t recreate the graphics of the 32X on the Game Gear, but Tempo Jr. is a pretty nice looking game for the system. It’s got good, clear graphics, with nice large sprites, colorful environments, and easy-to-see enemies and pickups. For a Game Gear game, this is definitely a top-level effort visually. The graphics have some detail to them, and some colorful art design too — just look at that main menu screen! There is slowdown when there are more than one or two enemies on screen, but that’s rare, so it’s not too bad. As for the audio, it’s decent GG audio, but like the Master System that it’s based on, the GG’s audio is no match for the NES or Game Boy. The advantage was visual, not aural. Also, the music doesn’t sound much like what you’d imagine Tempo would be listening to, obviously, but that’s just a limitation of the platform (and I don’t mind at least, I prefer cart music over that…). 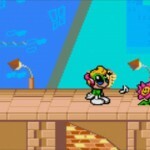 This entry was posted in Classic Games, Full Reviews, Game Gear, Reviews and tagged classic game, GG, Review, Tempo. Bookmark the permalink.